No. 39G, Jalan Kemuning Prima C33/C, Kemuning Utama, Seksyen 33, 40400 Shah Alam, Selangor, Malaysia. Vanntec Engineering Sdn. Bhd. Has been set up in Malaysia since 2010. 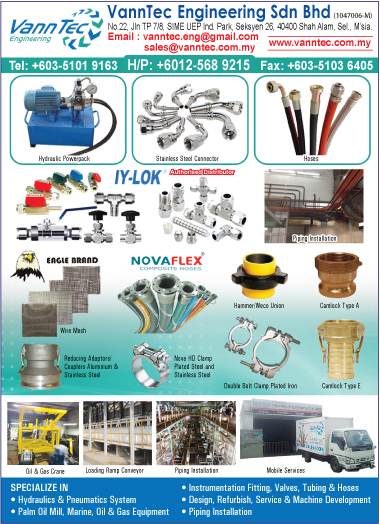 We are specialized in assembly of hose & fitting. Repair at site and etc. - Supplying palm oil mill, marine, oil & gas equipment. We hope we can able to have an opportunity to work together for mutual benefit. We also always commit to our jobs, and strongly believe in working alsongside our clients to ensure quality, timely delivery and hassle free supports.